A product of Peter Vermes’ reserve-heavy lineup, which including three rookies starting together for the first time in MLS play since 2007, Sporting KC had success pinging the ball laterally while being shutdown over the top. 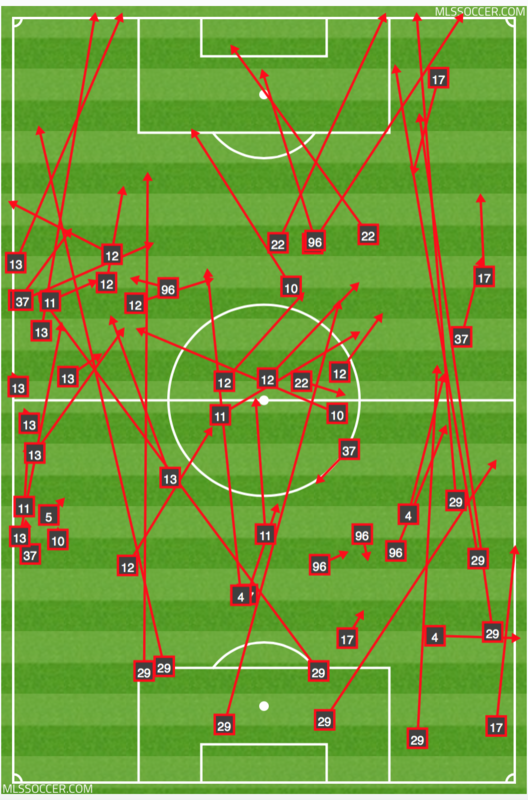 Below are the first-half passing charts for Sporting KC, with the length of the lines representing how far the pass traveled. 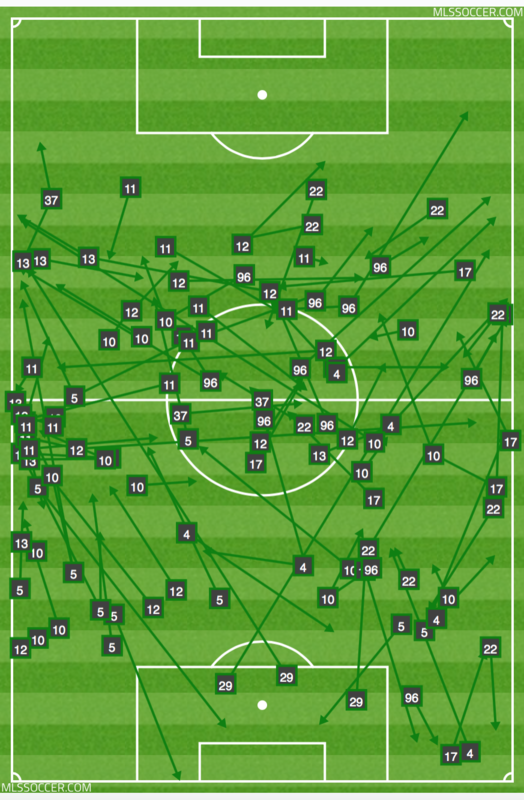 The first image shows the team’s successful passes, which were mostly short and aimed toward the sidelines. The second visual shows unsuccessful passes, which were much longer and directed toward Portland’s box. Again, this isn’t surprising given the personnel and their duties. Benny Feilhaber dropped back into Soni Mustivar’s defensive midfielder position, meaning he couldn’t expend his energy full on the attack. Forwards Bernardo Anor and Connor Hallisey often dropped back into what proved to be a five-person midfield, leaving Jacob Peterson to stand alone up top in a position he’s not exactly suited to succeed in. The trend didn’t teeter much in the second half despite bringing in Graham Zusi and Krisztian Nemeth. Sporting KC’s passing accuracy was 67 percent to Portland’s 73. But the latter’s moment of individual brilliance was enough to overcome any offensive deficiencies present Saturday. There are few players in MLS who can make both Diego Chara and Nat Borchers look silly defensively on the same play. Include Nemeth on that shortlist. With Sporting KC mostly sputtering in the final third, Nemeth took it upon himself to set up one of the prettiest goals scores so far this season and secure a massive road win. This goal confirmed what was true in Wednesday’s U.S. Open Cup Final and throughout the season: Nemeth has fundamentally changed Sporting KC’s attack. The 4-3-3 has been a standard in Kansas City since Vermes’ arrival in 2009. A byproduct of that formation and the system it’s played out in is a predictable attack predicated on crosses coming from the flanks. Nemeth, however, has shown an uncanny ability to not only set himself up with a goal-scoring opportunity, but also do so when there doesn’t appear to be anything there. Facing three defenders on Saturday, Nemeth zigzagged in and out of space before firing a low-lying shot into the far corner. Simply put, Nemeth is a game changer. In six regular-season games dating back to 2012, Sporting KC and the Timbers have combined for just eight goals, five of which came in a 3-2 Portland win in 2013 at Sporting Park. Had it not been for Nemeth’s strike Saturday, the two sides looked well on their way to their third scoreless draw in 2015. Why can’t these teams seem to find the back of the net with attacking quality all over the field? Portland is a dangerous team, but they don’t exactly play to their strengths vs. Sporting KC. Chara, Darlington Nagbe and Diego Valeri are playmakers who can abuse defenders with speed and technical skill. Against Sporting KC, teams with such qualities typically find success countering when Sporting KC is too far out on the front foot. But as evident in all three meetings this season, Portland doesn’t seem interested in following suit, even against two rookie fullbacks. Without the conscious threat of a counter, Sporting KC vs. Portland often turns into a logjam in the midfield. Thankfully, it’s a logjam with pace, unlike Sporting KC’s 1-0 loss to Houston on Sept. 23. ▪ What’s left to say about Tim Melia? He came up big in the Rose City back on Sept. 9 with seven saves, and again on Saturday with six saves and a shutout. ▪ Matt Besler and Kevin Ellis enjoyed perhaps their most complete performance on Saturday. Vermes lauded the pairing in his postgame teleconference, but especially Besler, who has played a major part in keeping Sporting KC on track in the last two months. Ellis had to be subbed off in the 79th minute with an apparent leg injury, but Vermes doesn’t expect it to be serious.